Showcasing the best examples of current design, Carrot City presents strategies for reintroducing urban agriculture to our cities. Over forty innovative projects explore creative approaches to making space for urban food production, ranging from ambitious urban plans to simple measures for growing food at home. Carrot City demonstrates how the production of food can lead to visually striking and artistically interesting solutions that create community and provide residents with immediate access to fresh, healthful ingredients. The authors show how city planning and architecture that considers food production as a fundamental requirement of design results in more community gardens, greenhouses tucked under raised highways, edible landscapes in front yards in place of resource-devouring lawns, walls that bring greenery into dense city blocks, and productive green roofs on schools and large apartment blocks that can be tended and harvested by students and residents alike. Carrot City curator Dr. Joe Nasr interviewed for the latest issue of the German architectural magazine Bauwelt (in German). Read the interview in here (pdf) or link to the whole issue here. Carrot City curator Dr. Joe Nasr interviewed for this article on the success of Lufa Farms in Montreal. 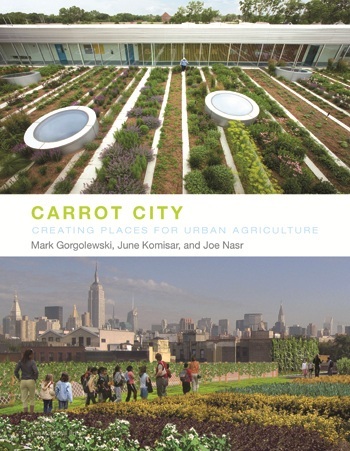 Carrot City curator Dr. Joe Nasr interviewed in this article on rooftop farming in New York City by Lisa W. Foderaro. Carrot City Reviewed in the Journal of Urbanism: International Research on Placemaking and Urban Sustainability, Vol. 5, Issue 2-3, 2012. Carrot City curator Mark Gorgolewski was recently interviewed for the Urban Agriculture edition of this newsletter published by Biohabitats. Reviewed by Kait Fowlie in "Get Stoked for Spring Sprouting: Pick up Carrot City, the Urban Agriculture and Design Book"
Reviewed by Carolyn Ireland in "A book that aims to bring the farm to the city"
+ Carrot City named one of the top 10 food books of the year by The Atlantic! Carrot City: Creating Places for Urban Agriculture was included in this list by this blog on landscape architecture issues. "Five Canadian books put urban agriculture on the map"